The German Supreme Court ruled on Wednesday that children of any age (one of the children in this case was 12!) had the right to access the identifying information of their anonymous sperm donor, a major step towards ending sperm donor anonymity in the country. The court rejected the notion of a minimum age on behalf of children, but did require that it be shown that the child requested the information. News reports also suggested that the court indicated that “the private life of the donor must be taken into account,” but not reading German I can’t confirm what the Court meant in this regard (though I suspect the Court was being itself somewhat vague and uncertain). It has been estimated that there are currently 100,000 German citizens fathered by sperm donors with an additional 1,500 to 5,000 born each year. There is a definite trend in rejecting sperm donor anonymity across the world that continues to gain steam. For reasons I have expounded elsewhere, I think the argument for ending anonymity, and its reliance on best interests of the resulting child reasoning, is problematic. But in other work I have also examined whether increasing compensation for sperm donation may increase the number of men willing to be non-anonymous donors. Whereas “allocation of scarce resources” is a buzz phrase that inspires a great deal of distress and desire for good ethical argument, “waste avoidance” strikes us as a relatively uncontroversial method for containing health care spending. Perhaps this is because rationing implies a trade-off between two individuals, each of whom have the potential to benefit from a possible intervention, whereas waste avoidance, on the other hand, implies a trade-off between two services – one of which has the capacity to benefit an individual, and the other which does not. Surely the latter trade-off is preferable, and perhaps even imperative, to make before we take up the former. This week U.S. Secretary of Health and Human Services Sylvia Burwell signaled a commitment to making the latter trade-off in her announcement on a complex area of health care financing: Medicare payment & payment reform. Medicare payment is one of the few levers that the federal government has relatively direct control over when it comes to controlling health care spending, and Burwell’s announcement was a welcome change in the policy discourse from the oft-lamented “doc fix”/SGR debacle (a fix for which was just bypassed again). In her announcement and this perspectives piece in NEJM, Burwell set goals to (1) move 50% of Medicare payments to alternative payment models such as Alternative Care Organizations (ACOs) and bundled payment arrangements by 2018, and (2) tie 90% of all Medicare payments made under the traditional fee-for-service model to quality or value, through programs such as the Hospital Value Based Purchasing and the Hospital Readmissions Reduction Programs, by 2018. Notably, these are the first explicit goals for transitioning to alternative payment models and value-based payments that have been set in the history of the Medicare program – though it remains to be seen how these goals will be pursued. As an update to my previous post here on medical students and professionalism, Judge Sutton writing for the Sixth Circuit found that a medical school could deny a degree to a medical student for failing to meet “professionalism” requirements. According to the opinion, the medical student had come late to classroom sessions, allegedly behaved inappropriately at a formal dance, had to repeat his internal medicine rotation due to poor performance, and had been convicted of driving white intoxicated. The Sixth Circuit found that Ohio, where the medical school is located, treats the relationship between a university and a student as contractual in nature, with that contract’s terms supplied by the student handbook. As the handbook in this case included professionalism as part of the academic curriculum, the university’s determination that the student failed to meet professionalism requirements was an academic judgment and thus merited deference by the court. Last summer, Judge Gwin of the Northern District of Ohio found that the medical school went beyond its scope of duty by extending its determination of professionalism well past academic or patient related matters. The district court found for the student, noting that the “character judgments” found by the university were “only distantly related to medical education.” In my last post, I noted that this separation of personal character from competence to practice medicine seemed troublesome. The Sixth Circuit’s opinion reversing the district court shows similar concerns. Thomas L. Greaney is Chester A. Myers Professor of Law and Co-Director of the Center for Health Law Studies at St. Louis University School of Law. Greaney joined the faculty at SLU LAW in 1987 after completing two fellowships and a visiting professorship at Yale Law School. He became Chester A. Myers Professor of Law in 2004 and was named Health Law Teacher of the Year by the American Society of Law, Medicine and Ethics in 2007. His academic writing has been recognized six times by the Thompson Coburn Award for SLU Faculty scholarship. Greaney’s extensive body of scholarly writing on health care and antitrust laws encompasses articles published in some of the country’s most prestigious legal and health policy journals. He has authored or co-authored several books, including the leading health care casebook, Health Law. A frequent speaker in academia and the media, Greaney has also offered expert testimony at hearings sponsored by the Federal Trade Commission on the issues of applying competition law and policy to health care, and submitted invited testimony to the U.S. Senate on competition policy and health care reform. Last month, NPR and ProPublica reported a story that would be shocking if it weren’t sadly familiar about how nonprofit hospitals like Heartland Regional Medical Center in Missouri are suing their patients and garnishing their wages for unpaid bills. A few days later, on December 31, 2014, the IRS issued final rules for tax-exempt hospitals that ostensibly will make these practices more difficult, if not illegal. Gates Annual Letter: Where’s the policy? In recognition of how little we talk about global health, I am turning my attention back to my roots for today’s post. On Jan 22nd, Bill and Melinda Gates launched their annual letter. For those readers who live fully under a domestic health policy rock, Bill and Melinda Gates are co-chairs of the Bill and Melinda Gates Foundation, which donated more than $1 billion in 2013 to global health activities. Aside from that enormous sum, the foundation is commonly looked upon as an example of what strategic philanthropy can do. The 2015 Annual Letter, launched on January 22nd, resembles previous letters insomuch as it strikes an optimistic tone about the progress made to date and makes bold claims about the future impact of the foundation. Specifically, the Gates’ tell us that they are aiming to have impact in four areas in the next 15 years – health, farming, banking and education. In the area of health, the letter specifies a focus on several specific projects, including cutting the number of children who die before 5, reducing the number of women who die in childbirth, wiping polio and three other diseases out entirely, finding the secret to the destruction of malaria and forcing HIV to a tipping point. For our purposes, what’s most interesting about the letter is what it doesn’t say. It makes no mention of law or policy and makes only passing reference to regulation and governance. What is this about? Measles Can Kill, And It’s Spreading. Sue Parents Who Didn’t Vaccinate? Absolutely. I heard it over dinner at a friend’s house. I talked about it on a call with a scientist. I discussed it while waiting for public health officials to issue an update on the measles outbreak. The same murmured question, the same growing fear. What happens if a child dies because some parents decided not to vaccinate their own kid? What happens if it’s my child? Thankfully, it’s still a hypothetical. But there’s reason to worry: More than 100 people in six states are now sick with the measles, in an outbreak that can be traced directly back to Disneyland. Dozens of newborns have been put into isolation. 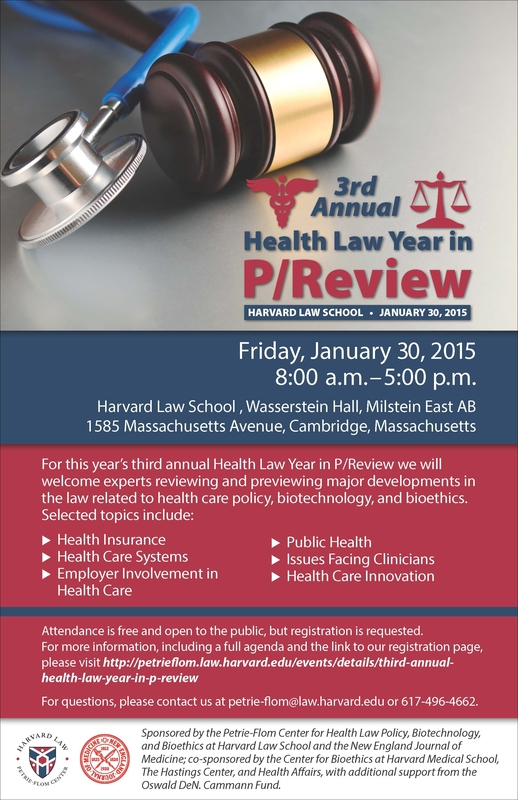 Please join us for the Third Annual Health Law Year in P/Review symposium, with leading experts discussing major developments during 2014 and what to watch out for in 2015. The discussion at this day long event will cover hot topics in such areas as health insurance, health care systems, public health, innovation, and other issues facing clinicians and patients. The full agenda with speakers is available on our website. Attendance is free and open to the public, but space is limited and registration is required. Please register here. Contact petrie-flom@law.harvard.edu with questions.